KIEV, Ukraine -- A video showing the interrogation of alleged Russian servicemen captured in Ukraine has sparked concerns about the treatment of prisoners of war in the conflict. 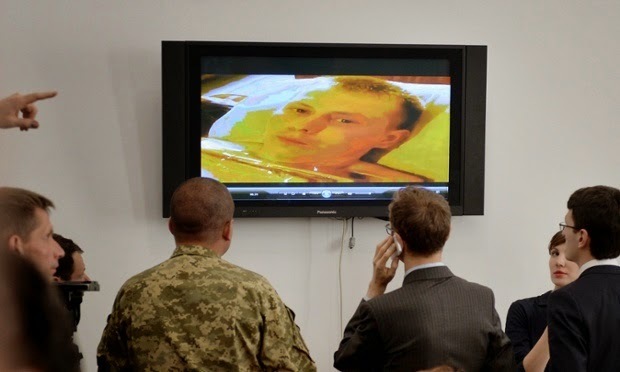 Journalists watch a video allegedly showing a Russian soldier captured during recent battles near the Luhansk region town of Schastya. The footage of one of the two men captured in eastern Ukraine on Saturday appears to show him lying on a hospital bed identifying himself as serviceman Aleksandr Aleksandrov, who says he was part of a Russian special forces group. “We were discovered. I was wounded in the leg as I tried to get away... We’ve been here four to five days,” he says to the camera. First shared on the Facebook page of Ukrainian MP Anton Herashchenko, the release of the footage has been criticised amid claims it violates the Geneva conventions. The conventions ban exposing POWs to “public curiosity”. The treatment of prisoners of war in the Ukraine conflict has repeatedly sparked concerns since fighting between army forces and Russian-backed separatists erupted last year. In the past months, rebels have paraded Ukrainian prisoners of war (POWs) before an angry crowd on the streets of Donetsk, Ukraine has released videos showing apparent forced confessions of captured Russian paratroopers, and several videos posted online appear to show brutal treatment of Ukrainian soldiers at the hands separatist groups. This week, Kiev’s capture of the two alleged Russian servicemen has once again raised concerns about whether Ukraine is abiding by international law in its handling of POWs. “It’s in violation of Geneva rules on treatment of POWs,” Francois Heisbourg, chairman of the International Institute for Strategic Studies and the Geneva Centre for Security Policy, said on Twitter of the video. At the heart of the debate over whether the release of the video constitutes a violation of international law is the question: is Ukraine at war with Russia? The Geneva conventions’ ban on subjecting POWs to “insults and public curiosity” applies specifically to armed conflicts between states, which Russia steadfastly insists the Ukraine conflict is not, portraying it instead as a civil war. Kiev, NATO and western governments say there is evidence that Moscow is backing separatist rebels with personnel, weapons and training, allegations that the Kremlin has repeatedly rejected while conceding that Russian “volunteers” and soldiers no longer in active duty have fought with separatists. Some Ukrainians argue the video shows that Moscow is indeed involved in military conflict, despite its denials. The Russian Defence Ministry said on 18 May that Aleksandrov and the other captured man, Yevgeny Yerofeyev, indeed served in the military but were not active servicemen at the time they were detained. “Either these are POWs and Russia is involved, or they are illegal trespassers, and Geneva Conventions do not apply. You decide. Regardless, they are treated humanely by all accounts,” the Ukrainian embassy in the Netherlands claimed in a Twitter discussion about the ethics of releasing the video. The International Committee of the Red Cross, the guardian of the Geneva Conventions, has called the war in Ukraine a “non-international armed conflict”. Under this status, “public curiosity” does not constitute a war crime. Instead, there must be evidence of “outrages upon personal dignity” and “humiliating and degrading treatment”. But Ukraine claims the video is proof of Russia’s involvement in the conflict. “For us, it is very important to present to the entire world Russian soldiers who supposedly do not exist on our land,” Ukrainian military spokesman Vladyslav Seleznyov told news agencies. But the footage presents an interesting catch-22: by gaining recognition from the international community – and the Red Cross – that it is at war with Russia, Kiev would bind itself to the Geneva conventions’ ban on subjecting POWs to “public curiosity”, making it liable to charges for sharing the video footage. A violation of international law? Experts differ on whether the release of the video constitutes a Ukrainian violation of the conventions. “There are still rules and there’s still customary international law that applies,” Solis says. He adds that under the Geneva conventions’ criteria for international conflicts, the video “absolutely” violates the statute barring “insults and public curiosity”. “You don’t show someone in any circumstance, whether they’re in a hospital bed or standing upright, for purposes of satisfying public curiosity,” Solis says. David Glazier, a former surface-warfare officer in the US Navy who now teaches national international law, disagrees. It has since been reported that the Ukrainian Army’s chief of staff, Viktor Muzhenko, vowed to put the two prisoners on display for the international media, a move that Glazier says “probably would cross the line”.